On this week’s podcast: The Canadian government has come out with some of the details of its $950 million Innovation Superclusters program. Five superclusters are going to be selected and provided with well over $100 million apiece in federal funding, and startups are required to be included. We look at some of the details of the program that are particularly relevant to startup ecosystems. 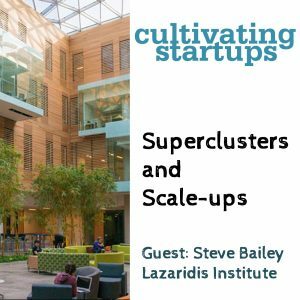 We then talk to Steve Bailey of the Lazaridis Institute at Wilfrid Laurier University in Waterloo. They’ve just started a search for a second cohort for their annual scale-up program—a six-month program to help grow Canadian companies that includes a week of making connections in Silicon Valley. We also talk about the startup data platform that the Lazaridis Institute has developed with Hockeystick that recently received $2.5 million in federal funding.